FedEx pilot Bryan Webster was waiting for his Cessna Caravan to be loaded with cargo and spending the time browsing through aviation periodicals. An article about ditching was of particular interest because his job involved single-engine operations over bays, large lakes, and shorelines. He recognized that even when within gliding distance of land, there are times when an engine failure could result in ditching because a forced landing on hostile terrain might be the less-desirable alternative. Webster was startled by facts taken from a Canadian government study stating that more than two-thirds of the small percentage of those who perished in a ditching were uninjured from the ditching itself, but failed to extricate themselves from the aircraft and drowned. (The remaining pilot and passenger ditching fatalities died from impact injuries, non-fatal injuries that resulted in drowning, and exposure.) Of the vast majority who survived a ditching, only 8 percent were documented as managing to escape the aircraft without some degree of difficulty. Furthermore, Webster learned, the study stated that ninety percent of those who drowned without egressing were involved in a ditching during which the aircraft became inverted in the water. The probability of survival (which exceeds 90% overall) is many times greater when the aircraft comes to rest right side up. Unbeknownst to Webster at the time, this was to become a turning point in his life. After considerable research, he decided to develop a curriculum, design necessary equipment, and form his own company, Aviation Egress Systems, Ltd., in Victoria, British Columbia. His one-day course is specifically tailored for general aviation pilots and has become so popular since its inception almost two years ago that Webster ultimately resigned his position with FedEx. He now devotes all of his energy to teaching pilots what they need to know about evacuating an aircraft in the water. Each class is limited to six students and is held at the large (24 by 37 feet), heated, indoor pool at the Iris Garden Country Manor, a delightful bed-and-breakfast in a forested suburb of Victoria. My motivation in taking the course stemmed from an accident I had in Alaska in 1972. Following an engine failure, the Piper Super Cub that I had been flying wound up inverted in the water. My first instinct was to attempt pounding out a window, but water resistance prevented me from developing sufficient force. Panic began to set in, and I felt pain developing in my chest as I resisted the natural and almost overwhelming urge to inhale. After conceding that this might be the end of my life, the thought finally occurred to open the door. I did and found myself standing in 5 feet of water. The panic caused by suddenly discovering myself inverted and underwater in an airplane had numbed my mind and delayed logical action almost until it would have been too late. I realize now that the ordeal would have been far less traumatic had I been exposed to underwater egress training prior to this accident. Webster also teaches a simple procedure to prevent the door from closing during a water landing. Prior to landing and with the door open (ajar), turn the door handle as if you were going to lock the door normally. In most aircraft, the locking mechanism extends aft and strikes the outside of the doorframe, thus preventing the dynamic forces that can occur during a water landing from forcing the door closed and trapping you inside. Webster explained the need to remove and stow headsets and other loose objects before ditching because they can become projectiles upon impact with the water. He also demonstrated how headset wires connected to their jacks could impede egress. Perhaps the most critical lesson is to resist the temptation to hurriedly release your seat belt and shoulder harness even if the aircraft submerges and especially if it is inverted. Doing so can cause you to begin floating in the cabin and perhaps into the rear seat or tail cone where you could become trapped. Disorientation at such a time is likely and the mere act of locating the door and/or its handle can be difficult if not impossible. Many have drowned because they had become turned around and tried desperately to turn the door handle in the wrong direction and wound up breaking it off instead, forever sealing that exit and diminishing hope of survival. Instead, the pilot needs to maintain his orientation, his normal, relative position with respect to the door or emergency exit. He should resist unbuckling himself until locating the door, opening the exit, and creating an escape path. The next 2-4 hours (depending on how much experience you want or need) of the course are spent in and around the pool with occasional briefings in the sauna and refreshment breaks. Students also are given an opportunity to practice opening the side window of a Cessna 172 and experiencing what it is like to escape through such a window while underwater. Webster says that the dunker reminds some of bungee jumping; it doesn't look intimidating until the rope is tied around their ankles. I could sense an increase in my pulse rate as I sat in the dunker at the top of the ramp and looking down toward the water at a 45-degree angle while waiting to be released. The dunker hits the surface at only 20 mph but at a much steeper angle than would occur during an actual ditching, which helps to simulate the real thing. You barely have time to take one last breath before being hit by a wall of water, simulating an �exploded� windshield, which often occurs during an actual ditching. 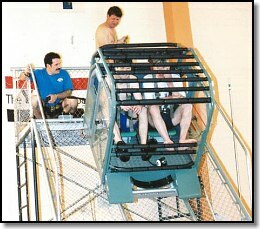 During this first exercise, the dunker remains upright, and you have little difficulty getting out as long as you remain calm and remember the Golden Rule: Do not unbuckle yourself until using familiar reference points in the cockpit to locate the door, find the handle, and create an escape path. 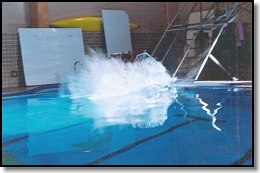 In the event that something occurs to prevent the dunker's door from opening conventionally (this has never happened), Webster or the other diver can pull a rod that allows the door to fall away and enable rapid egress. If the seat belt or shoulder harness should jam (this has not happened either), the student can be quickly disconnected from the dunker (while still wearing the belt and harness) and hauled to the surface of the pool. Webster claims that no student has ever been injured or endangered. During the second dunking, Webster and his assistant flip the �aircraft� upside down, and this is much more disconcerting and challenging. But confusion is avoided as long as you obey the Golden Rule. I used to think that it would be easy to distinguish up from down by exhaling and observing the direction of bubbles. I discovered that this might not be possible during a ditching because there is a chaotic storm of bubbles amid the churning water. Also, the bubbles might lead you to a dead-end trap in the tail, which often contains a large air pocket that keeps the aircraft in a tail-high attitude. At night or in murky water, you might not see bubbles at all. After hitting the water during the third attempt, Webster and his associate do their best to disorient the student by rolling and pitching the dunker every which way until finally allowing it to come to rest in some unusual and inverted attitude. Next comes the two-place dunker. Its cockpit is the size of a Piper Pacer and is used to teach a pilot how to save an injured passenger unable to extricate himself. After getting out of the aircraft, the pilot is taught to initially ignore the passenger and head for the surface for a fresh supply of air. He then goes underwater and swims to the door through which he will assist his passenger, which is not particularly easy when the limp body is hanging upside down. I found it difficult just to find and unbuckle his seat belt. 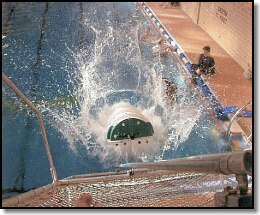 (In the meantime, the student playing the part of the injured passenger is breathing through a regulator and an air tank installed in the dunker because the rescue sequence can take up to a minute. 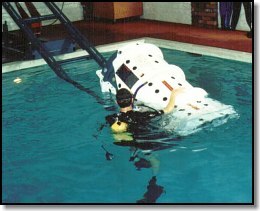 The final exercise involves riding either the single- or two-place dunker into the water while wearing a pair of goggles with black lenses to simulate ditching at night. After Webster and his friend have finished rolling and pitching the dunker, you find yourself in a world of black confusion. But strict adherence to the Golden Rule quickly restores confidence and allows for an expeditious escape. All of the exercises are challenging even though conducted in a warm, indoor pool during daylight hours. The experience is thoroughly educational and filled with camaraderie. I discussed with fellow student, Robyn Astaire, how much more difficult it would be to survive a �water landing� in cold, rough water, especially at night. We learned enough to know that we didn't relish the thought and vowed to modify our flight-planning philosophy with respect to operating over and near bodies of water. When a pilot's life is in peril, there is a tendency to panic, especially when a pilot is untrained for the emergency and unprepared to survive. There is little doubt that Webster's course will help to replace panic with confidence should you wind up inverted in the water. Considering the increasing popularity of Webster's course, one might say that he is making quite a splash. 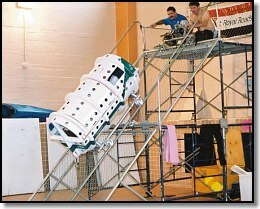 Editors Note: While most dunker training in the U.S. is pretty expensive, as Webster is quoted stating in this article, the Marine Survival Training Center, University of Louisiana at Lafayette offers reasonably priced courses with state of the art equipment. However, like most such training available, it is geared to helicopter egress, not specifically General Aviation. It has been brought to our attention that there was another competatively priced Canadian dunker training organization apparently existant at the time of Webster's start, Pro Aviation Safety Training, estabilished in 1998 and also located in British Columbia. SELECT AND USE OUTDOORS AND SURVIVAL EQUIPMENT, SUPPLIES AND TECHNIQUES AT YOUR OWN RISK. Please review the full WARNING & DISCLAIMER about information on this site. © 2002-2006 Equipped To Survive Foundation, Inc.